A group of Palace fans will join their counterparts from Fulham on an away day march from Craven Cottage to Selhurst Park to raise awareness and profile of mental health and male suicide. 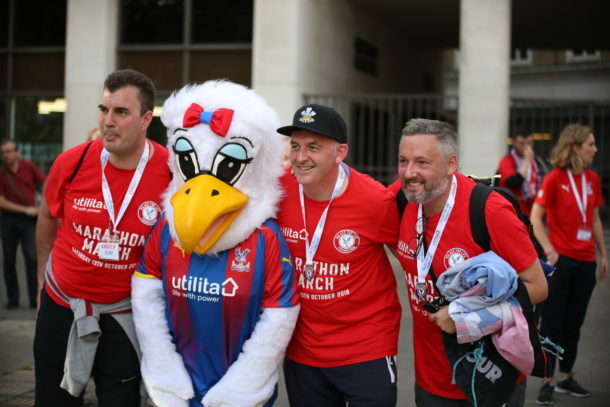 A bit of healthy competition sees Palace fans vying to turn Fulham red and blue prior to the match between the two sides on Saturday 2 February, but the opportunity to raise visibility and encourage people to talk and seek help are the main aims of the event. Palace fan Paul (right) is helping to rally fellow fans to get involved. A powerful message of two groups of rival fans coming together on a match day, and spreading awareness through action and speaking out about their own experiences, is one the fans hope is a catalyst to inspire change and encourage communication. The fans have planned this event to raise awareness, instead of money, and are encouraging more people to join in to get as much support as possible. Statistics* show that one in four people in the UK suffer with mental health problems, and 84 men take their own life every week, making suicide the single biggest killer of men under 45 in the country. Statistics like these show how crucial it is for awareness events such as this to become more common in our communities. The walk is taking place on Saturday 2 February, with fans walking the 10.5 miles from Craven Cottage to Selhurst Park. The walk should take roughly three hours and will be completed at a’ walk and talk pace’! To get involved or to find out more, contact Lee Adams (@Matchwornshirt1) or Paul Price (@HC15OnTour) on Twitter. *Statistics taken from CALM, and The NHS Information Centre for health and social care.